Joe Engel was born on October 9, 1927 in Zakroczym, Poland, about 25 kilometers from Warsaw. The town was small, about 10,000 people, with a Jewish population of 1,000 to 1,500 families. The community was fairly poor, and consisted of mostly working people, such as shoemakers or tailors. They had plenty to eat, because most of Poland was farmland, but there was little or no extra money to spend on luxuries. Medical facilities were scarce, but twice a week a dentist would visit and three times a week a doctor would visit from Warsaw. Joe was born in his own home with the help of a midwife. Joe's parents were uneducated and hard-working. He had eight brothers and sisters, and the family of eleven lived in a rented three-room house without a gas stove or running water (Joe and his siblings washed in the morning by hand). Zakroczym was about 10 km from the nearest train station, and Joe's father, Moishe, owned two horses and a buggy that served as a taxi service. Joe's two older sisters owned a small store that sold ices, candy, and other little items. His mother Esther (née Zylberstein) stayed at home and cared for the children all day. Twice a week, Joe's mother went to the farmer's market. Lacking refrigeration at home, it was necessary to shop often. Joe believed that his parents had so many children because "in the old days there was no television, no movies, no nothing, so that's the only pleasure they had." It was important to have a large family in his community. Joe grew up speaking Yiddish and a mix of other Eastern European languages including German, Polish, and Hungarian that Poles considered to be a sort of "broken" language. He spoke Yiddish at home and at cheder (Hebrew school), so the only time he was required to speak Polish was in public school. When Joe was five years old, he started attending cheder. There, he studied Hebrew, learning by the Torah. A rabbi taught in his own house and charged 50 cents per week per student. The age that children began attending cheder depended on the family's income; Joe's older siblings had more education "because if you had too many children you could not afford to send [all of] them to school." Joe began attending the Polish-run public school at age 7. He attended public school during the day and continued going to cheder during the evenings. The family's landlords were not Jewish, but the Engels had a decent relationship with them. Joe remembers playing with Jewish and non-Jewish children growing up, including the landlords' children. However, Joe did deal with some anti-Semitism as a child. He remembers witnessing bullying at school, Polish children beating up Jewish children, and teachers giving harsher punishments to Jewish students. At the market, sometimes people would stand by Jewish merchants and shout to prospective customers not to buy products from Jews. Joe began hearing about the Nazis in 1935 or 1936. Because Zakrocyzm was so small, there was little concrete news, just frequent rumors. For the most part, everyone went about their lives, completely unprepared for what was about to happen. Joe remembers seeing the Polish army marching through Zakroczym to protect the country in 1939. They had cannons, and everything was pulled by horses. They marched to the border, nearly 200 kilometers away. There were no tanks or other forms of transportation, just the cavalry. When they came through Zakroczym, they mobilized all the horses in the town, including the horses that Joe's father used for his taxi service. Clearly, the Polish cavalry was no match for the more technologically advanced German army. A few days after the Germans occupied Warsaw, they arrived in Zakroczym. The armies fought at a large fortress about three km from the town. 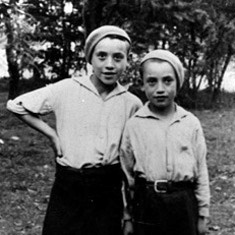 During the fighting, the inhabitants of Zakroczym, Poles and Jews alike, retreated to the woods, where they had bunkers. After the fighting, the Germans destroyed much of what was left in Zakroczym. Joe's family stayed in the town for a few more days, then put all of their belongings on buggies and pushed them to Warsaw, which had been greatly damaged by aerial bombing in the early days of the war. They stayed with some relatives for a few days, then slept where they could, in synagogues or churches. After living like vagabonds, the family moved farther east, to a city called Plonsk. 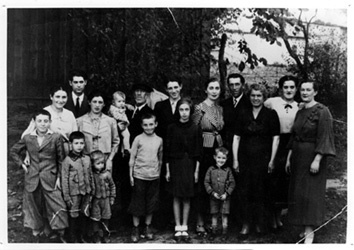 Plonsk was eventually turned into a ghetto, and the family stayed there until they were taken to the concentration camps. While in the ghetto, they had ideas about what was going on, but they underestimated how serious the situation actually was. They thought they would be sent to work in labor camps, and that families would eventually reunite there. 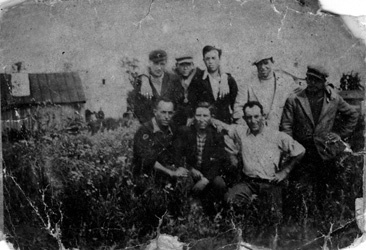 The Plonsk ghetto was an organized community consisting of 20,000 to 25,000 people. A Jewish police force called the Judernat, with a leader who acted like a mayor, enforced the Nazis' regulations. Guards were posted at a high fence, so no one could leave or enter the ghetto. Food was distributed through a ration or food stamps system, and the Jews received just enough food to survive. There were no doctors, medication, or hospitals. Everyone was dirty, the water was dirty, and there were lice everywhere (according to Joe, you could take your shirt off, shake it, and actually see the lice being shaken off). As a result, many people were sick, and Joe's family suffered from typhus. Throughout Joe's stay in the ghetto, selections were made. The Germans would tell the Judernat one day in advance how many people they needed to round up to send to the camps, and the Judernat members themselves were required to make the selection. Joe's parents were taken in the first selection. He never saw them again. Some of his brothers, sisters, and nephews were taken in a subsequent selection, and lastly Joe, two remaining brothers, and one sister were taken together. Upon arriving in Birkenau, the prisoners were lined up, their clothing was removed and replaced with prison uniforms, their hair cut, and a number was tattooed on their bodies. Then they were sent to their assigned barracks (men and women were separated, so Joe and his brothers were separated from his sister). There were no showers or heating, and the barracks were constructed from wood, so there was little insulation from the elements. The roads around the camp were mud. The prisoners became aware of the existence of gas chambers very soon after arriving in Birkenau. Birkenau was a work camp, and the prisoners had to do all sorts of physical labor, such as unloading bricks or cement and digging ditches. The SS soldiers kept a close eye on the workers, beating them if they weren't working fast enough. The SS had the power to do whatever they wanted to the prisoners and were never questioned about mysterious deaths or inhumane beatings. We were in the ghetto until 1942. Life was miserable, there was sickness and all kinds of things. In 1942 they decided to liquidate the ghetto. They started to make selections. First, they separated the families. They took the parents, the older people, to the railroad station. They put them in the cattle trains, without water, without food, and they sent them off. Of course, no one knew the destination. Nobody came back. A couple months later, they made another selection, and they took middle-aged people with kids, and they sent them off the same way they sent the first ones off. But I just happened to be the last one; this was in '42, when they started to liquidate the ghetto. I was one of the last ones, [of] about 2000 living in the ghetto. They took us to the railroad station and they put us in the cattle trains. They closed the windows, without food, without anything. We waited there for a while, and finally the train started to roll. We were there for four days and four nights without food, without anything. After four days the train finally stopped and when they opened the doors, half of them didn't make it because they didn't have anything to eat. The other half, there was a doctor outside named Joseph Mengele. Out of about 2,000 people, he selected 250 or 300. The rest of them he sent to death, to the gas chambers. But in 1942, when I got to Auschwitz, in Birkenau, the gas chambers were not finished yet. So they dug holes, big holes, and when the people came, they forced them to go into the ditches, with their kids and everything else. They took gasoline and sprayed it all over them, and they also took gas bombs, and threw them in. And that's the way they went to their death. Every day 10-15,000 Jews used to come in from Eastern Europe. This was how they got rid of the Jews as fast as they could. After this, when the gas chambers were finished, Dr. Mengele was there...he used to say, leave your belongings here, you're going to go take a shower, and after this you're going to get reunited with your family. They used a special gas there, Zyklon-B, and after 10-15 minutes they were all dead. The people who used to work there in the gas chambers used to also be inmates. They worked for a couple months, then they put them [to death] in the same way, in the gas chambers. When they opened up the door in the gas chamber, they still could see some people living there; the parents hugging their kids and the kids hugging their parents. Some of them were very much alive. So what they did, they had escalators and elevators, they took those [bodies] upstairs and they cremated them. You could see it there, you could smell the flesh, because [there were] 4 big chimneys. The smoke would be coming out constantly, 24 hours a day. 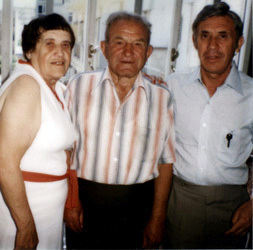 After staying at Birkenau for about three months, Joe was separated from his brothers and sent to a quarantine in another part of Auschwitz. After just a couple of weeks, he was selected in a group of 100 young boys to attend a bricklaying school in the Auschwitz main camp. Here, life was better, if that term can be applied to life in the camps. He was given some food and new clothing, and the boys had the luxury of spending the winter indoors while learning the trade of bricklaying rather than working hard outside in the snow. The German officer in charge of the barrack here was exceptionally cruel, however. Prisoners often traded food to eat the things they enjoyed the most or to feel as if they had somehow acquired more food (an example of a trade might be potato peels for a piece of bread). The German officer would punish the prisoners harshly for trading if he caught them, because meals were designed to give just enough nutrients keep the prisoners alive for a precise length of time, and substituting one thing for another could affect the Germans' calculations. If the officer caught a boy trading food, he would take him outside, naked, pour ice cold water on him, and make him kneel for a couple of hours in the freezing winter. Many prisoners died under this treatment. In January 1945, the Germans made an effort to move the surviving inmates deeper into Germany. Without adequate clothing or food, the prisoners were forced to march long distances through the snow. Anyone who couldn't keep up was shot immediately. The prisoners marched from Auschwitz through the night to Czechoslovakia. They stayed in a soccer stadium for 24 hours, and then they were packed into open cattle cars. Joe was nervous. Just as before, there would be no food or water provided, and the cars were packed. However, there was an important difference between these cars and the ones that took Joe to Birkenau--the roof was open. He waited until sundown, and a few hours after dark, Joe jumped out of the cattle train into the snow. He decided that taking the chance was his only hope for survival. If he got caught he would get shot, or he might die in the cold, but there was also a chance that he would survive and make his escape. When he jumped, the train stopped. He buried himself in the snow and hid until the SS soldiers gave up on finding him. That night, he came across some railroad workers who took him into their quarters for the evening, feeding him and keeping him until morning. It was a dangerous operation, not just for Joe the escaped prisoner, but also for the workers, who would have surely been shot if discovered harboring a Jew. In the morning, the workers told Joe how to get to the woods and avoid the SS soldiers patrolling the area. After many attempts, he finally managed to join a resistance group that fought against the Nazi army. At night they would go on missions, such as destroying police stations. The resistance consisted of a few hundred men divided into smaller groups, who would change camps nightly. In March 1945, Joe and fellow survivors were liberated by the Russians. At first, it was difficult to convince them that he had escaped from a death march and that he was not some sort of spy, but after speaking with high-ranking Jewish officers, he was able to convince them of his story. After liberation, Joe returned to Poland. He stayed for six months, until he was drafted in the Polish army. Not willing to join the army, he escaped to West Germany. He found that his sister had survived and was living in Belgium, and that his two brothers had also survived. Through an organization that helped Jewish people reunite with their families, Joe contacted an aunt in the United States who provided an affidavit for him to immigrate. It took him years to get permission, but on March 13, 1949 he arrived in New Orleans, then rode a train to Charleston to meet his family. Joe has been back to Poland twice since coming to the United States. There is hardly anything left of his life before the war. In Zakroczym, there is no one left that he knew, and few people remember his family. On one of his trips to Poland, Joe's companion was arrested for taking pictures and accused of being a "spy"—a spy in his hometown! They eventually convinced the police that they were innocent, but their photographs were confiscated anyway.